Cleveland, OH (January 9, 2017) – Franchised new vehicle dealers across Northern Ohio sold 8,386 new trucks and SUVs in December, an increase of almost 13 percent for the month—ending 2016 with a sales trend seen across the entire year. While truck and SUV sales grew by almost 8 percent in 2016, sales of cars were off 7.77 percent for the year. In total, combined sales of all trucks, SUVs and cars were off 2.45 percent for the year, according to figures released today by the Greater Cleveland Automobile Dealers’ Association (GCADA). The figures are in line with the GCADA’s year-end projections. Positive market factors should continue to drive new vehicle sales in 2017, including: plenty of available and affordable credit; strong lease deals, and a consumer desire for the connectivity, driver’s assistance and new technology on today’s vehicles. In addition, there is still plenty of pent up market demand, due to the fact that many of the vehicles on the road are more than 11 years old, and will soon need to be replaced. The consumer trend toward trucks and SUVs will likely continue in 2017, especially if fuel prices remain low. Franchised new vehicle dealers sold 19,985 new vehicles in December of 2016 compared to 20,465 in the same month a year prior, a decrease of 2.35 percent. For the year, dealers sold 245,474 new vehicles in 2016 compared with 251,651 in 2015, a decrease of about two and a half percent. 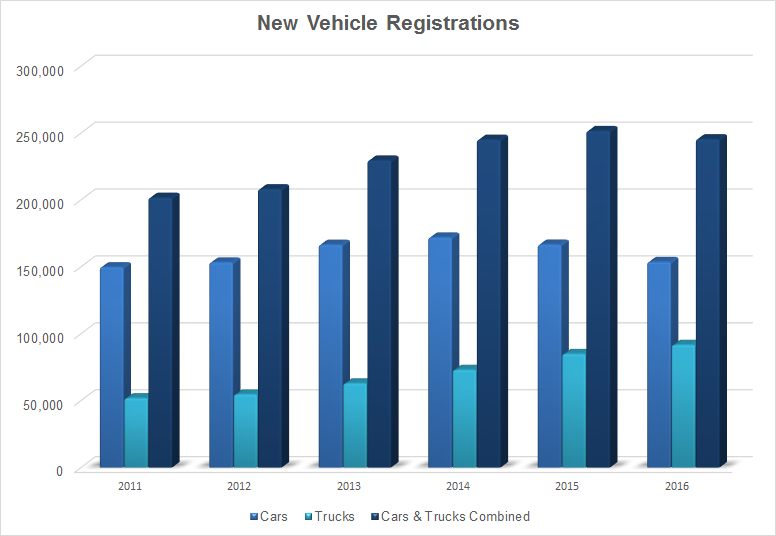 Sales of used vehicles ended the year basically flat with 2015, with dealers selling 196,765 used vehicles in 2016 compared to 195,849 vehicles in 2015, an increase of just under half a percent for the year. Ford kept its crown as Northern Ohio’s bestselling brand in 2016, selling 38,743 vehicles for the year. Chevrolet was close behind with 36,940 vehicles sold, followed by Honda at 21,043 vehicles and Toyota with 20,724 vehicles sold for the year. Big winners for 2016 included Buick, Fiat, Jeep, Lincoln and Volvo, with each brand ringing up strong double digit growth when comparing 2016 with 2015. While it doesn’t have the same volume as other brands, Jaguar had a phenomenal year, registering sales growth of more than 110 percent for the year. The following brands posted sales increases in December of 2016 versus December of 2015: Audi, Buick, Chevrolet, Fiat, Honda, Hyundai, Infiniti, Jaguar, Jeep, Maserati, Mercedes-Benz, Ram, Smart, Subaru, and Volkswagen. The following brands posted sales increases for 2016: Audi, Buick, Cadillac, Chevrolet, Fiat, Honda, Infiniti, Jaguar, Jeep, Land Rover, Lincoln, Mercedes-Benz, Ram, Subaru and Volvo.